I saw a picture of Rosie depicted with Veteran’s Day coming up. The red bandanna caught my eye and I thought a Rosie the Riveter costume would be a perfect outfit to put together. 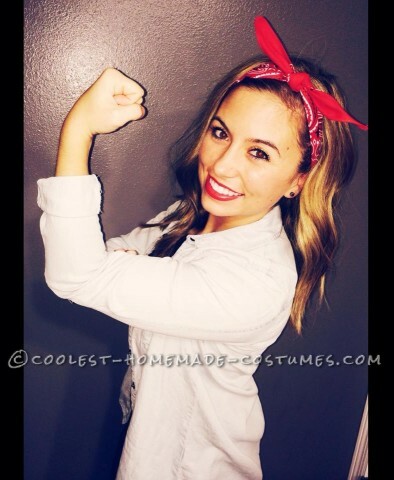 All it took to put this costume together was a simple blue work shirt, a red bandanna, and some red lipstick. That’s it. I was ready for the night out. I was warm and comfy all night as it does cool off into the 40s here this time of year. I made the mistake of buying some cheaper red lipstick and it ended up on my teeth several times. I was complimented several times on how beautiful I looked without having to play it up and show skin to be noticed. It was a fun costume wear and was easy to pull off on a budget. As well, I was great looking like the proud strong woman I am! I love how simple this is, but yet I knew who she was depicting as soon as I saw it! I love how simple this is, but yet I knew who she was depicting as soon as I seen it!! Love the Look!!! Too cute!! I love it! So classy and classic! I lovee it! so classy and classic! She looks so cute as Rosie. Beautiful girl and great costume for all sizes! Great idea! :) <3 it! You look adorable! I love this look. Maybe next year’s costume. Love this costume she’s so pretty!